Peter Poulakakos is plenty dedicated to the Financial District—the prolific restaurateur has a whopping 10 projects below Chambers Street including James Joyce homage Ulysses and the Irish gang-themed Dead Rabbit. The setting for his latest, with partners and fellow history buffs Danny McDonald and Michael Jewell, is a pier that's been closed to the public for 127 years, a retrofitted re-creation of the Gilded Age divided into three levels and anchored by a soaring clock tower. Decked out in nautical relics like pipes from steamship engine rooms, the first floor includes a belly-up bar slinging on-tap dark-and-stormys and Pimm's cups, a raw bar shucking oysters and steaming clams, and an expansive beer hall pouring old-world European suds and their modern counterparts (Guinness, Keegan's Mothers Milk). 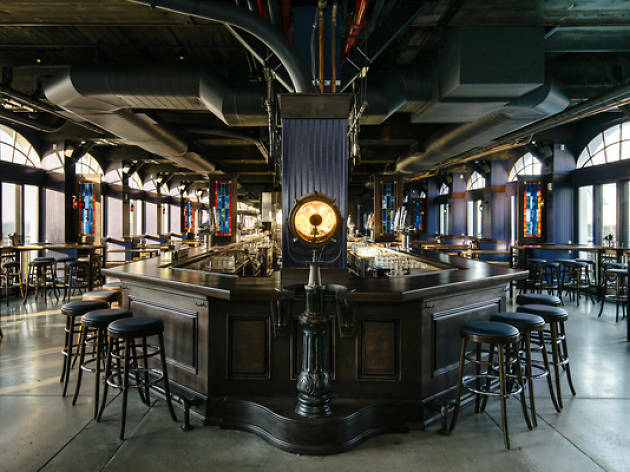 Upstairs, the second-floor dining room is split into four, named for a maritime police boat, a firefighter patrol boat, the nearby Lady Liberty and W.R. Grace, the mayor who signed off on the pier. The top tier, an event space reserved for community gatherings (think poetry readings and music performances), overlooks the harbor. Finally!! That building was supposed to be open over 10 years ago! !